There are approximately 37 spaces available. Each artist is asked to donate an item between $35 - $50 for the silent auction. The $10 application fee is waived if you were a 2009 vendor. Applications can be found here and are due by July 1st, 2010. Accepted vendors will be notified by email/phone starting July 1st, 2010. Memorial Day weekend is upon us, here are a few shows you might want to check out during your 3-day weekend! "Each day is filled with live music, food, arts and crafts, a petting zoo, carnival rides, games, and business booths. Every day features a different special event: Battle of the Bands, Bike and Trike Show, Classic Car Show, Christian Music Concert, and Fireworks." The re-scheduled Vendor Blender will be taking place this weekend at the First United Methodist Church! There will be over 40 arts & crafts vendors, face painting, and the church will have their thrift store open as well! They are also inviting individuals who own Classic Cars to come show off their pride, by entering their Car Show! Entry is $10 per car, and winner will receive a Plaque or Trophy! "This is the last weekend for Scarborough Renaissance Festival- A re-created 16th Century English Village with 21 stages of entertainment, over 200 shoppes with unique handmade merchandise, games of skill, human powered rides, and a wide variety of food and beverage." As always, I'm wishing our vendors and shoppers lots of good luck and good weather! Tents/Vendor signs are provided for all vendors. Water source to fill containers for washing. 1 plug on a 20-amp 4-way plug for craft booths. Dumpster or compactor nearby for solid waste. All vendors will be listed on the FaS website as well as in the event program. Their application is available here. Vendors will be notified of acceptance by 8/1/2010. "This craft fair will be held at St.John the Apostle Catholic Church. The Knights of Coumbus will be selling food and drinks. They operate on a ticket option for purchasing of food and drink, and game participation. The school festival will also be open during the craft fair and will feature games and bounce houses aimed at the kids." Booths are 10X10 and cost $40 for the two day event. Booth spaces can be shared between two vendors if needed. All spaces are outside. Electricity is available upon request. There is no wifi available. The deadline for pre-registration is September 1st, but late registration will be accepted through September 15th. Get crafty during a tour featuring artworks that inspire paper crafts; then discuss related projects, and learn a new skill during a demonstration. Crafters of all media are welcome, and refreshments will be provided after the tour. Be sure to send images of your finished project inspired by this program to webmaster@cartermuseum.org. The submitted images will be displayed on the Carter’s Facebook page. This will be their 3rd "Crafting from the Collection" event which is FREE and features a tour of 3 or 4 featured works of art. They will provide sketching paper and pencils at the event, or you can bring your own sketch pad and paper. Important to note: Pens are not allowed. "The Historic Mansfield Arts Festival has expanded to two locations this year — the Friday evening concert will be at Steven's Garden & Grill and moves to Smith Street (one block east and parallel of Main Street) on Saturday. The festival on Saturday will feature local artists and craftsmen, live demonstrations, as well as recorded and live music throughout the day and into the night. And it's all just a short stroll over to Main Street where you can experience a whole new world of Historic Mansfield." Booth spaces are 10X10 and cost $95. Early registration has already ended. Applications can be found on their website here. More event information can be found on their site. Have we finally chased the rainy weather away from our beloved weekends? As a vendor who is scheduled to be outside on Saturday, I sure hope so! "Don't miss the 1st Annual Vickery Spring Fling benefiting the Vickery PTA! The gym will be filled with vendors selling a large variety of items!" "The Arlington Highlands and F6 Gallery presents Art in the Park. The event features over 100 various artists from the Dallas Fort Worth Metroplex combined with the retailers of Arlington Highlands to offer the community a great day of fun for all to entertain." "The Festival is an outdoor event held on the grass on the Historic City Square. In addition to the artist exhibits we have live music performances in the center of the Square during the event." Come check out some seriously yummy locally grown food, arts, and crafts at the Coppell Farmer's Market! It's a great way to support all aspects of your local community. The Curious Cake Shoppe wiil be set up, swing by and say hi! "The morning begins with Family Time, which features the return of Critterman and his Texas Safari. The festival has over 120 booths with food, shopping and entertainment. Free admission, free parking and bring your cooler!" This is the last Gypsy Handmade Market of the summer! Go check their new store and the awesome market artists! Good luck to all the artists and crafters setting up this weekend! Enjoy this beautiful weather, it's overdue and I sure hope it sticks around! For more information, contact Tyler Stevens at tydbowlstevens@gmail.com. 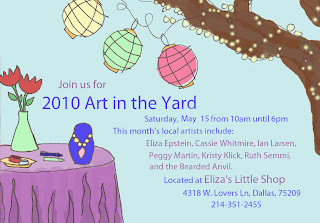 Sounds like it is going to be yet another busy Arts & Crafts weekend all over the metroplex! Chances are, there is a great show happening in your neck of the woods, so run out and support your local Arts & Crafts community! This first event is *not* an Arts & Crafts Show. It does look like a fun event that we could all benefit from, so that's why I'm posting it! "ArtCycleTx is a movement that encourages artists to re-purpose, re-design and re-distribute unused (or gently-used) art related resources and supplies." "Enjoy the family friendly Kidz Korner, strolling entertainers, buskers and acrobats, the Taste of Texas Food Garden, the City of Richardson Petting Zoo, the art Guitar Auction, and lost of interactive displays and exhibits." "This year's event promises to be the best yet - there are an outstanding fifty-four venues all around the Near Southside full of art and music. Fort Worth South, Inc. will be providing a circulator bus and pedicabs, so you can enjoy Arts Goggle car-free!" "This month's local artists include: Eliza Epstein, Cassie Whitmire, Ian Larsen, Peggy Martin, Kristy Klick, Ruth Semmi, and the Bearded Anvil." "Stroll, stride, push or pedal to Lakewood Village Shopping Center and enjoy free live music on several stages from 12 – 8 pm. We’re inviting our neighbors to shop, eat and drink locally and learn about greener living choices. There will be kid’s activities and many fun surprises. Admission is FREE!" Come check out several fun new handicrafting artists at the Gypsy Wagon's new home! Good luck to all the artists and crafters setting up this weekend! "Under cool, towering oaks, enjoy colorful crafts and artwork from across the state. Artists present creative gift ideas. There are fun children's activities and plenty of refreshments to satisfy your gastronomic adventures." Booths are 10X10 and cost $85 for one or both days. Applications are here and due by May 18th. Space assignments will be announced May 28th. It's that time again! That's right, it's time to raise your voice, let us know you're out there, and win something awesome for FREE! This week's giveaway is sponsored by Eye On The Sparrow. If you aren't familiar with her work, I've got to tell you, it's amazing! 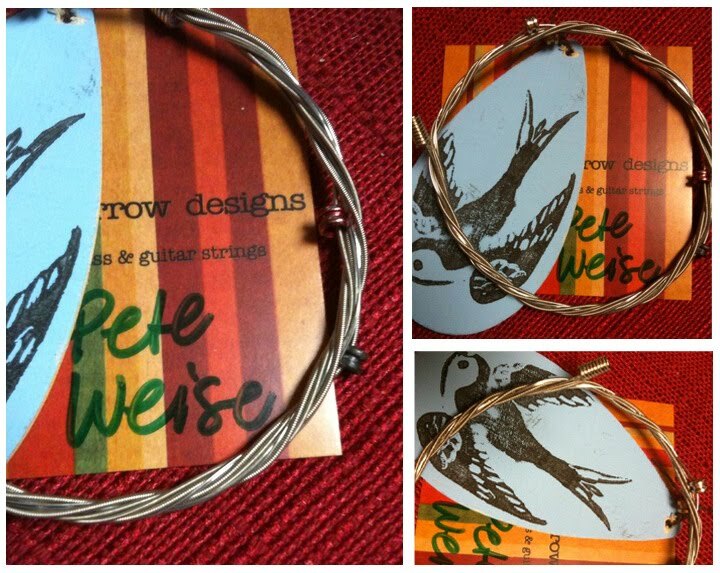 Abbie, owner and artist behind Eye On The Sparrow, creates all her jewelry from used guitar strings. A lot of musicians just throw their strings away, but the great ones send them over to Abbie to be brought back to life! Abbie donates a portion of the proceeds for each sale to the Carter Albrecht Music Foundation. One lucky DFW Craft Shows reader will WIN this beautiful Slim Silver Restoration Bracelet made by Eye On The Sparrow, a value of $34.00. Made with stainless steel guitar strings donated by Pete Weise of Denton, this bracelet measures approximately 2 3/8" in diameter, 7 1/2" in circumference. How to Enter: Simply leave a comment here or on our Facebook page and tell us about one local North Texas Show you are looking forward to selling or shopping at during the months of May - June! Contest ends at 10:00PM on Tuesday, May 18th. Winners will be announced the morning of Wednesday, May 19th, 2010. There are many much-anticipated Arts & Craft Shows happening this weekend! I've been wandering through all their websites and completely lost track of time. How is it Friday already?! I apologize for leaving you hanging until now, shame on me! "A free arts showcase with multiple outdoor stages featuring dance, a variety of music and cultural performances, a juried art show, culinary demonstrations and wine tastings, complimentary admission to world-class museums, exciting exhibits, interactive children's activities and much more!" "The Bazaar Days is an indie art and commercial gift fair in Addison, Texas. The event will feature the work of over 60 local artists, designer and crafters. This show is supported by TURANT (Turkish American Association of Northern Texas). They will offer Turkish food, tea, coffee and traditional arts and crafts. TURANT KIDS folklore dance group will perform at Bazaar Days. This show is also supported by the Bulgarian American Cultural Center. They will show case their country’s arts, crafts and culture and the Bulgarian folk dance group will perform. There will be additional live music for everyone to enjoy!" "Event begins Thursday with a carnival in Harwood Park. On Saturday, activities include live entertainment, food, carnival, Bridgeport Idol contest and 90-plus vendors." The Gypsy Wagon has moved to their brand new store location and this will be their first Handmade Market at their new home! They have lots of fun vendors lined up: Crystal Ellis, Farrah Brothers, Sandy Earle, and Amy P. Lyons. "The Funky Finds Experience will be held in the Amon G. Carter Jr. Exhibits Building at Will Rogers Memorial Center in Fort Worth, Texas. This venue is climate-controlled, has quality lighting, floor outlets for a number of booth spaces, nice restrooms, an ATM, and a larger concessions area that will lend itself to better food options with the contracted company Aramark." Chairs and tables can be rented at an additional cost. 10% discount on booklet advertising – Booklet will be 8.5" x 11"
Applications can be found here and are due by August 1st along with the non-refundable $10 application fee. Accepted vendors will receive an email notification and invoice on August 15th. Full payment must be received within 7 days. Accepted vendors must be willing to donate an item to the charitable raffle.